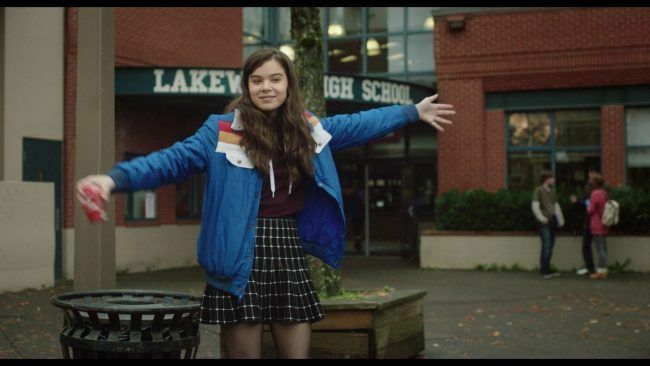 There’s a scene early on in “The Edge of Seventeen” that perfectly captures the mood of Nadine (Hailee Steinfeld). She’s been persuaded to attend a party with her best friend Krista (Haley Lu Richardson) and her brother Darian (Blake Jenner) in an attempt to ease tension over Krista’s new romance with Darian. As the SUV pulls up to the house party, Nadine sits in the back, with a face of pure resentment and dread, wishing that she could be anywhere else. As far as her party experience, it only gets worse. “The Edge of Seventeen,” directed and written by Kelly Fremon Craig (a writer for the 2007 movie “Post Grad”), is a coming-of-age film that utilizes drama and comedy to tell a story about teenage angst and loneliness. The film starts in medias res, as 17-year-old Nadine comes barging through Lakewood High School to her history teacher, Mr. Bruner (Woody Harrelson), and promptly declares she is going to commit suicide and that someone should know. In a sardonic response, Mr. Bruner tells Nadine of his own suicide letter, in which he states: “As some of you know, I have 32 fleeting minutes of happiness during lunch, which has been eaten up again and again by the same, especially badly dressed student, and I finally thought that I would rather have the dark nothingness.” This pretty much sets the tone for the obliquely sarcastic, quite sincere and slightly depressing toll that Nadine suffers. From there, the film backs up to the beginning and explains how Nadine arrived at her lonely existential crisis. All told through Steinfeld’s sarcastic narration, we hear how the father she adored died of a heart attack, how she met Krista, and about the antagonistic relationships with her brother Darian and her mother Mona (Kyra Sedgewick). After a drunken night of partying at home, she discovers Krista and Darian’s new relationship and struggles to accept the new reality. Faced with increasing alienation from Krista and Darian (most of which is imposed by Nadine herself), Nadine tangles with her newfound loneliness, confiding in Mr. Bruner and her classmate Erwin (Hayden Szeto), who is just as socially awkward as Nadine. The strongest elements are Hailee Steinfeld’s performance and the film’s comedy. Craig’s script basks in humor, evident in Mr. Bruner’s endless sarcasm, Erwin and Nadine’s semi-awkward interactions and the narration, insults and comebacks Nadine wields against her detractors. In addition, silence works alongside the jokes to craft the familiar experience of uncomfortable tension. In the hands of Hailee Steinfeld, Nadine shines in a role that audiences can relate to and simultaneously dismiss as standoffish. Steinfeld’s acting captures the emotions of a teenager in flux, with nuance paid to the small fluctuations of a face going from depressed to outraged. Her quick line delivery, slouched posture and strange interactions with the rest of the cast make the film all the more earnest. The banter between Steinfeld and Harrelson is a microcosm of the film’s fast-paced, sarcastic and honest nature; Nadine is the student mad at the world, Mr. Bruner can’t believe that he has to deal with this every lunch. The overall impression “The Edge of Seventeen” gives is that of a new classic in the teen film genre. Building off classic tropes such as the house party and the mentor teacher, the film expands beyond its genre conventions to portray the minutiae of the teenage experience. Social awkwardness, loneliness, rebellion and miscommunication intermingle with friendship, joy and parting witticisms wrought within a sincere depiction of adolescence. There’s a distinct accuracy in the way contemporary teenagers interact with each other, and the rumblings of discovering personal identity and meaningful relationships in their surroundings. Like “Clueless,” “Easy A” and “Sixteen Candles,” “The Edge of Seventeen” ranks among the best of films in this genre for its honest interpretation of the teenage experience.